Buckeye Firearms Association would like to congratulate Sean Maloney, on being chosen as the recipient of the very prestigous NRA-ILA "Jay M. Littlefield Volunteer of the Year Award." This is the highest award given by NRA-ILA to individuals who have dedicated themselves to the preservation of the Second Amendment, for advocacy and volunteerism. Sean is the NRA-ILA EVC (election volunteer coordinator) for Ohio's 8th Congressional District, has worked on several campaigns over the course of many years, is a Second Amendment rights attorney and is on the leadership team of Buckeye Firearms Association. Maloney was presented the "Jay M. Littlefield" award on Saturday at the NRA's Board of Directors meeting, held in Arlington, VA. NRA President David Keene, NRA-ILA Executive Director Chris Cox, and Buckeye Firearms Central OH Chair and NRA Board of Directors member Linda Walker presented Sean with his award before the Board of Directors, members, guests and NRA staff. Fairfax, Va. - Today, the National Rifle Association honored Sean Maloney with NRA-ILA Jay M. Littlefield Volunteer of the Year Award for his commitment, support and leadership to protect the Second Amendment. "In recognition of Mr. Maloney's continued dedication and efforts in the 2010, elections, we are pleased to present him with the '2010 NRA-ILA Jay M. Littlefield Volunteer of the Year Award,'" said Chris W. Cox, executive director of NRA's Institute for Legislative Action. "Without the determination, leadership and countless hours of volunteer support of people like Sean in defense of the Second Amendment, the rights of Ohio gun owners would have been lost long ago." 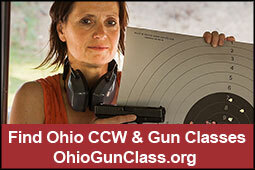 Maloney is an NRA-ILA Election Volunteer Coordinator in Ohio's 8th congressional district. He has excelled at recruiting volunteers at numerous events, volunteering immeasurable time to the campaigns of pro-gun candidates. His unwavering activism demonstrates he is more than deserving of this award. The NRA-ILA "Jay M. Littlefield Memorial Volunteer of the Year Award" is an annual honor that recognizes an NRA member who demonstrates exceptionally meritorious activism in defense of our Second Amendment rights.